Widnes Wild women’s team player Katie Fairclough has been selected for the Team GB women’s under 16s squad. The Widnes Wild women’s team could soon boast another international player on their roster as Katie Fairclough has been offered a place in the Great Britain Women’s Under 16s squad after successfully negotiating the trials at Sheffield last Autumn. She will now attend a series of training camps with the other girls who have also been selected, with a view to playing in international tournaments, although details of these have yet to be announced. 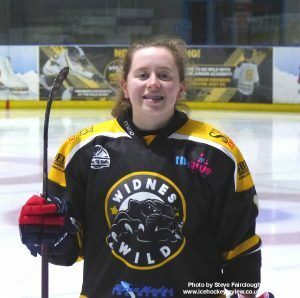 Katie is the third Widnes Wild women’s player to be selected for Team GB, following in the footsteps of Leen de Decker who has played over 60 world championship games for her native Belgium and Sophie Sinclair Reeks, who played for the GB Under 18s team at the World Championships in Poland last year. Katie only started playing ice hockey in 2015 when she joined the women’s hockey basics course at Silver Blades Widnes before joining the Wild Academy juniors set up. In early 2017 she was invited to train with the Wild women’s senior team and, in the summer, was given special dispensation to play league matches with them for the 2017/18 season, despite being a year younger than the normally permitted age of 16. She has played 3 matches so far and scored 1 assist. However, this meteoric rise through the ice hockey ranks is only part of the story. Katie actually learnt to skate on wheels first before taking to blades when she started going to sessions at Wigan Roller Rink with her sister Caroline back in 2012. She got involved with the junior inline hockey training there – which subsequently moved to the purpose-built hockey rink at Atherton. Since then, she has played for numerous inline teams at both her own age group and above and was selected to play for the Under 18 Junior Women Inline Hockey GB team at the 2016 FIRS World Inline Hockey Championships held in Asiago and Roana, in Italy. Now in her third season of inline hockey, Katie signed for the under-14 and under-16 teams with the Blackhawks Junior inline team at Simply Skate in Rotherham and the season is part way through. She also tried out for both the Women’s Inline Hockey GB team again, who are going to compete in the World Skate Inline Hockey Championships Italy in 2018 and the World Roller Games in Barcelona in 2019 – and has been accepted for both junior and senior teams. 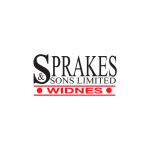 The Widnes Wild women’s team have three away games in a row in early February and have their next home game on Sunday 25th February when they play the Bracknell Firebees at Silver Blades Widnes – 5.30pm.